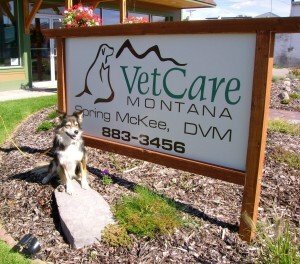 VetCare Montana is proud to serve Polson, MT and surrounding areas. We are dedicated to providing the highest level of veterinary medicine along with friendly, compassionate service. If you have any questions about how we can care for your pet, please don't hesitate to call us at (406) 883-3456. Thank you! Excellent service. Spring is extremely knowledgeable and knows exactly what our dogs need. We also utilize boarding and our fur babies always seem happy there. Today was Jack's (Border Collie mix we adopted three weeks ago from Texas) second visit to VetCareMT. The first was due to a cough he picked up in transit from Texas to Washington, now cured. Today was his initial screening visit. Same DVM, Dr Esch. Same... read more thorough check. Same fully explained answers to my questions and concerns. Under VetCareMT also is our other Border Collie, Phoebe, and our 17-year old cat, Sawyer - - both receiving same excellent care. They were amazing! The friendly staff was very patient with me while I asked questions and the doctor called me personally to give me an update on my cat. Reasonably priced and very helpful. Contact VetCare Montana to schedule an appointment or to request additional information about our services. We look forward to hearing from you.